Estimated Range Estimator for FPV Click to open. 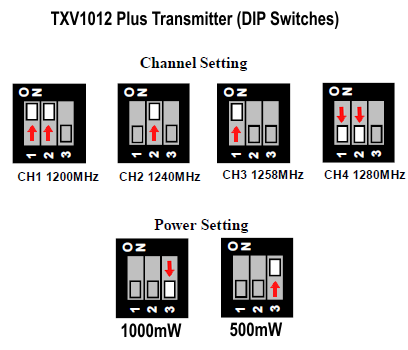 CH1-910Mhz CH2-980Mhz CH3-1010Mhz CH4-1040Mhz (USA customers will have only CH1-910 MHz available) Click here for transmitter channel configuration. 2. 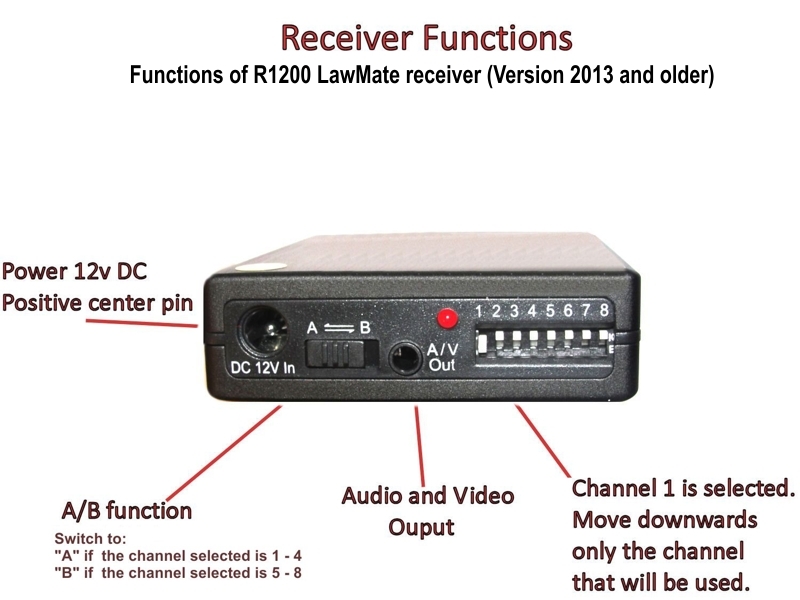 New Lawmate 1.2 GHz 1W (1000mW) transmitters available channels an DIP switches settings. 4. 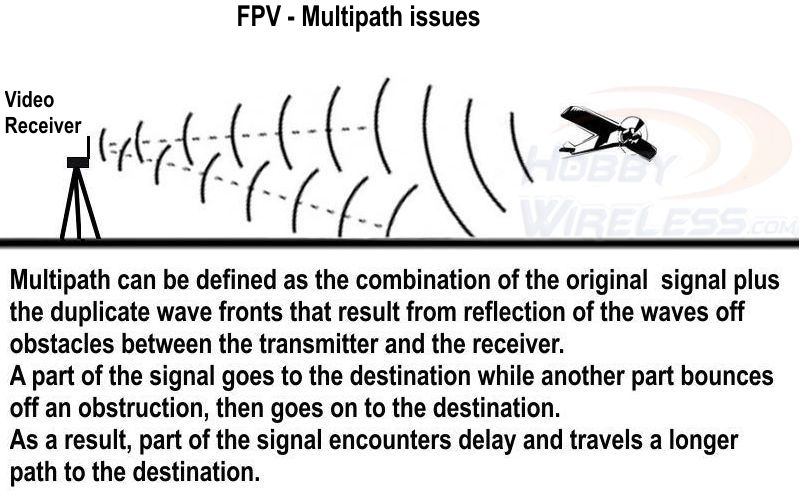 What else do I need to know about flying a FPV system? 1- Don’t fly too low when your model is too far. It migh cause your model to crash. 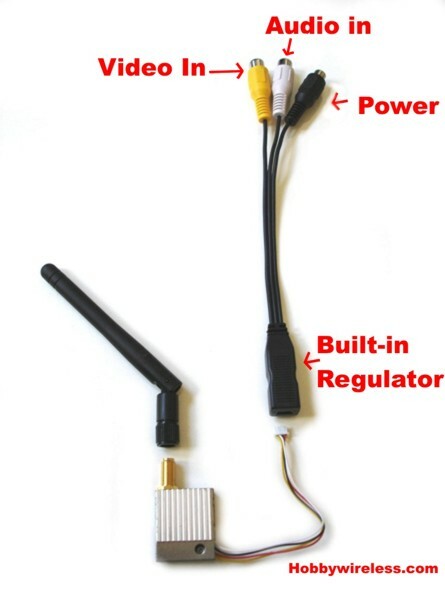 2- When installing your system into a model, try to keep your wireless video system as far as possible from the R/C system. 3- Always keep your a/v transmitter in a well ventilated place. NEVER confine the a/v transmitter where air flow is scarce, otherwise it can overheat and permanently damage it . For more useful information visit our FAQ page. 5. What is the best FPV system? 6. The differences between SMA and RP-SMA. How to adjust the built-in microphone's volume. Just punched the clear shrink wrap on top of the volume controller by using a needle or something with a sharp pointed end.Then with right sides of its or small flat head screwdriver gently turn clockwise to increase the volume, or counterclockwise to lower the volume. 8. 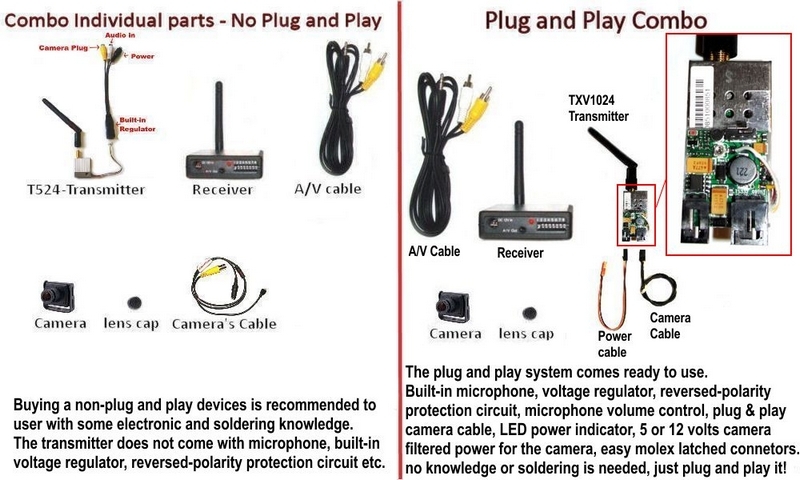 Do not force the connectors of your plug and play transmitter pulling them out without properly unlatching them. 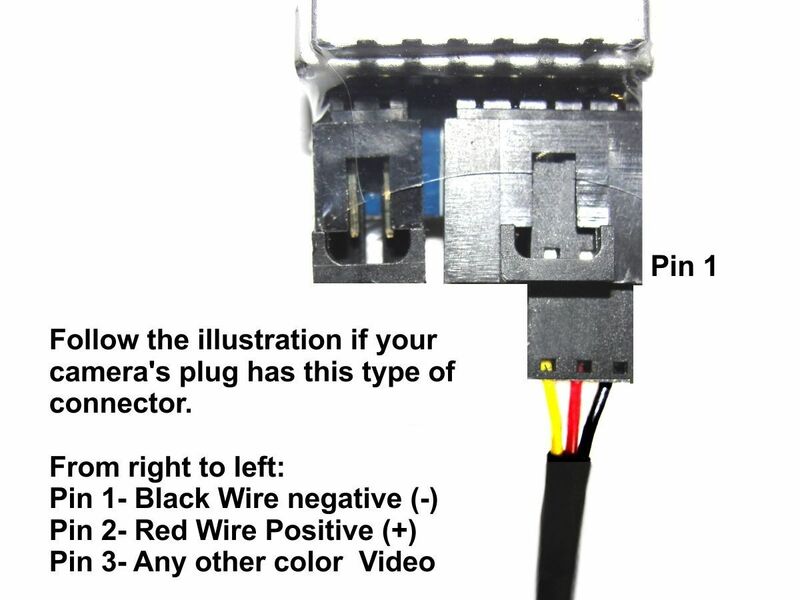 This may slide the connector house to slide off shortening the pins inside causing the camera not to work, or intermittently lose video. Stock whip antennas must to be in the same position straight vertical. 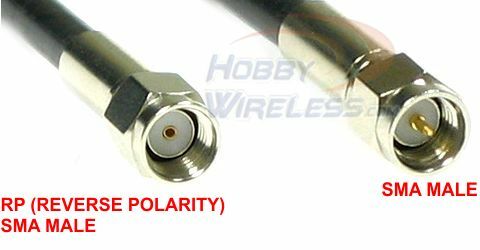 If one antenna is straight vertical and the other is leaning to any direction, it will aftect the performance. 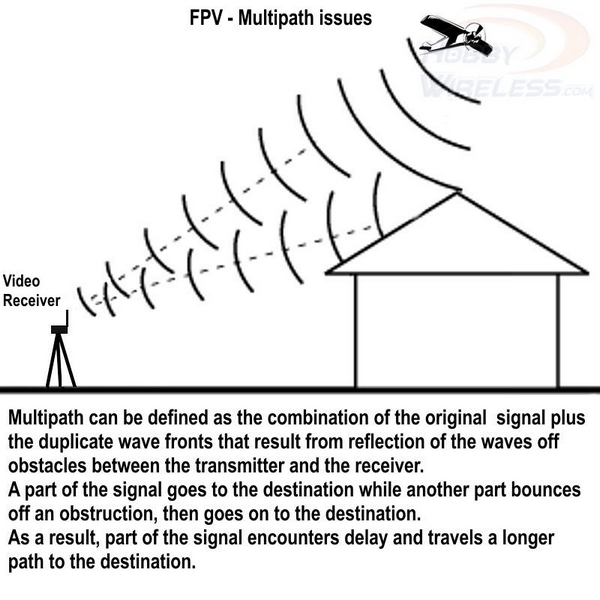 Multipath is a very common issue. 10. Examples of Multipath. (Click on the pictures to enlarge). 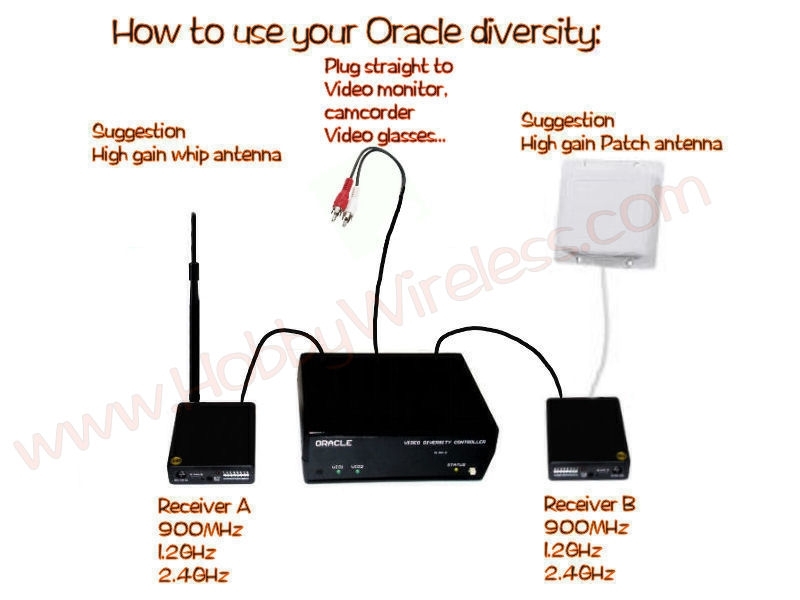 A good set of circular polarized antennas is the best way to deal with multipath issues. 11. 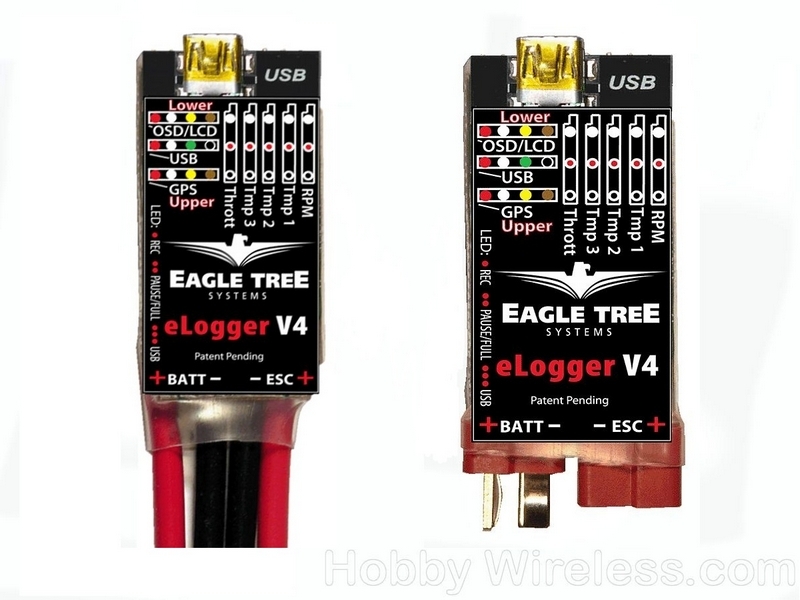 Eagle Tree OSD Pro - Except for the integrated connectors and the version with leads everything else is the same. 13. How to obtain 11.1v from a pack with 4S or more. 14. 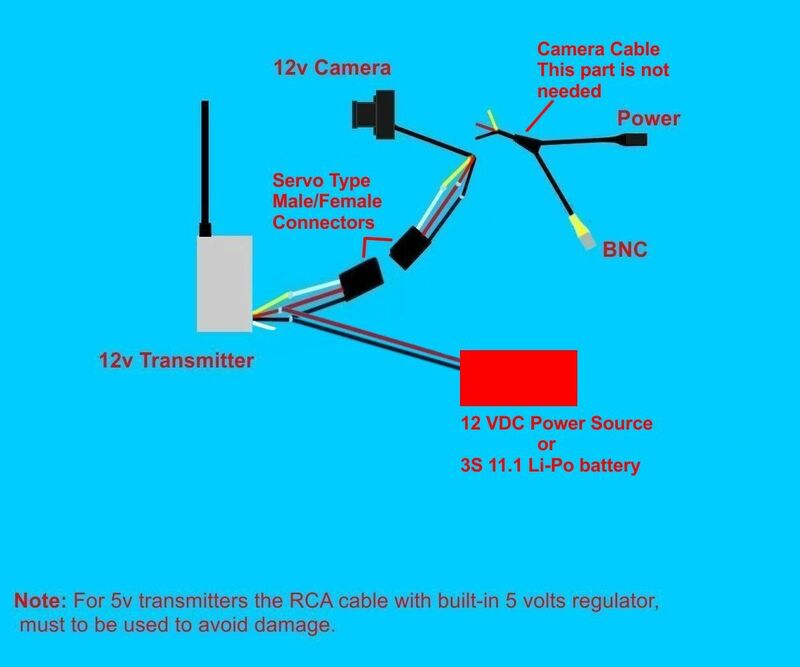 How make make connections for your "non-plug" and play 12v transmitter with 12v cameras. 15. T512 and T524 transmitters. 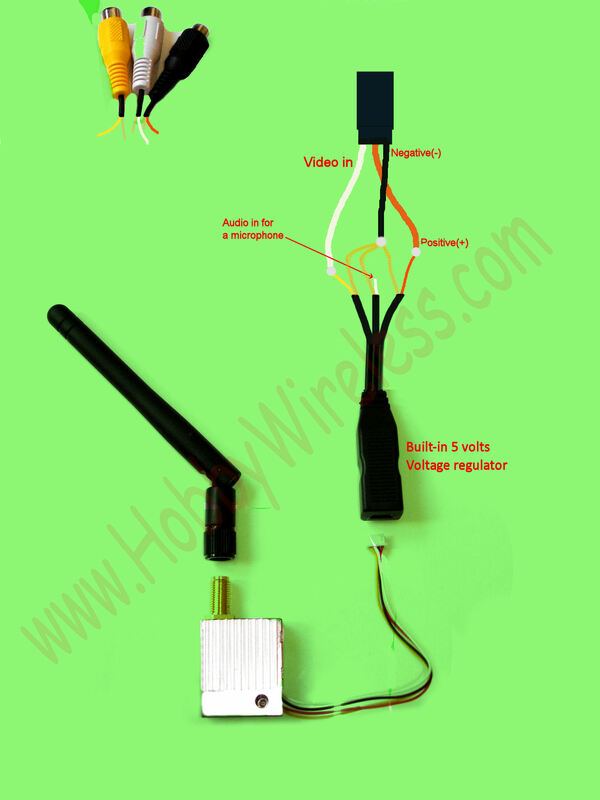 It's not plug and play version, you will have to use the heavy RCA connectors or customize your own. See next illustration below. 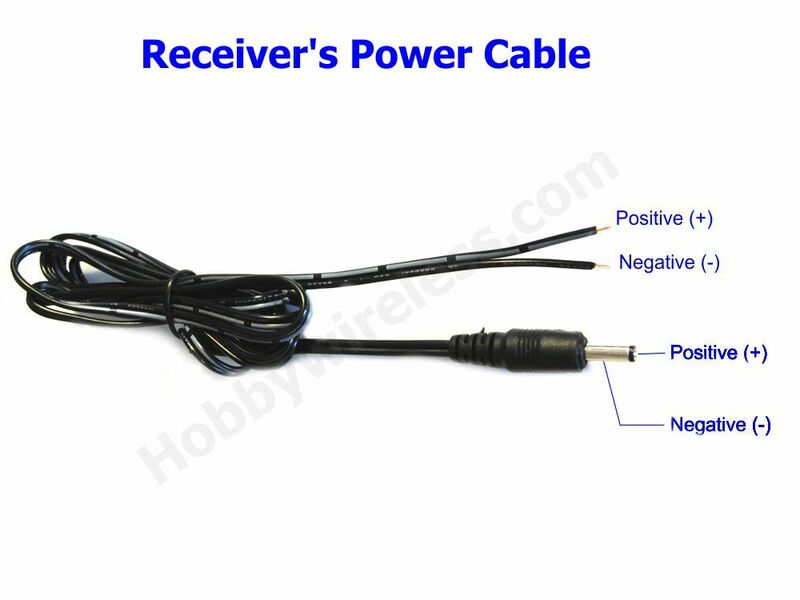 The cable has a built-in voltage regulator with that can be powered using 5 - 12 VDC MAX! 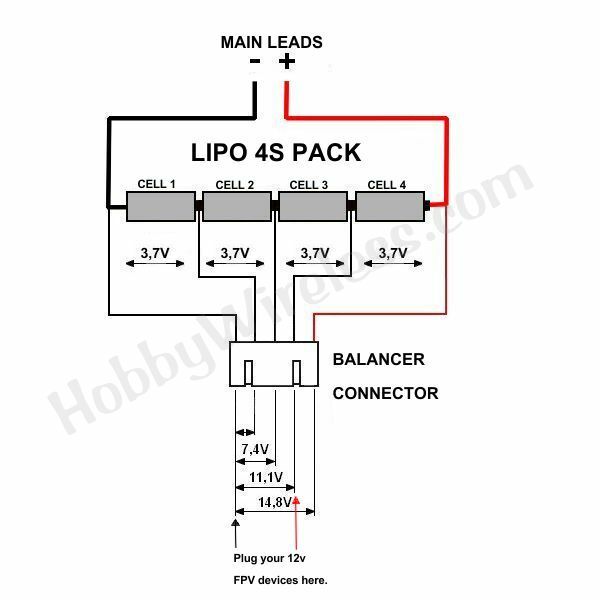 Using 2S 7.4V lipo is more adequate. 16. 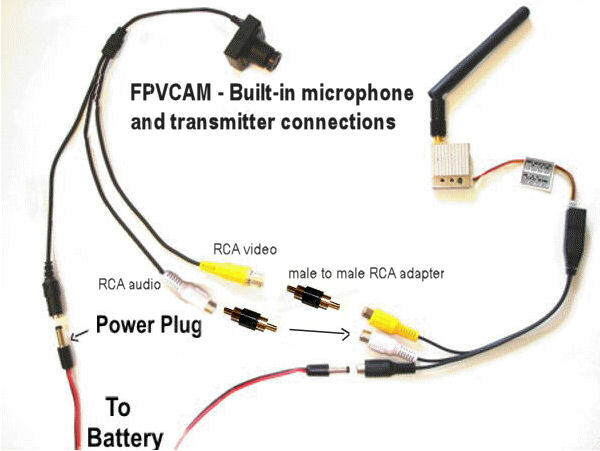 How to remove the RCA connector from the transmitters (not plug and play version). 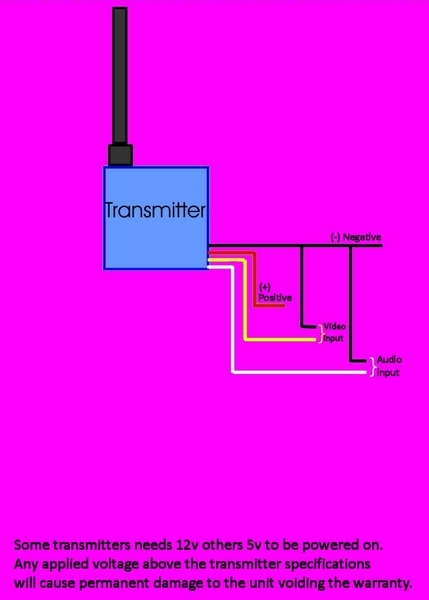 Test your transmitter before cutting the wires. * Make sure the wire are well insulated. 20. 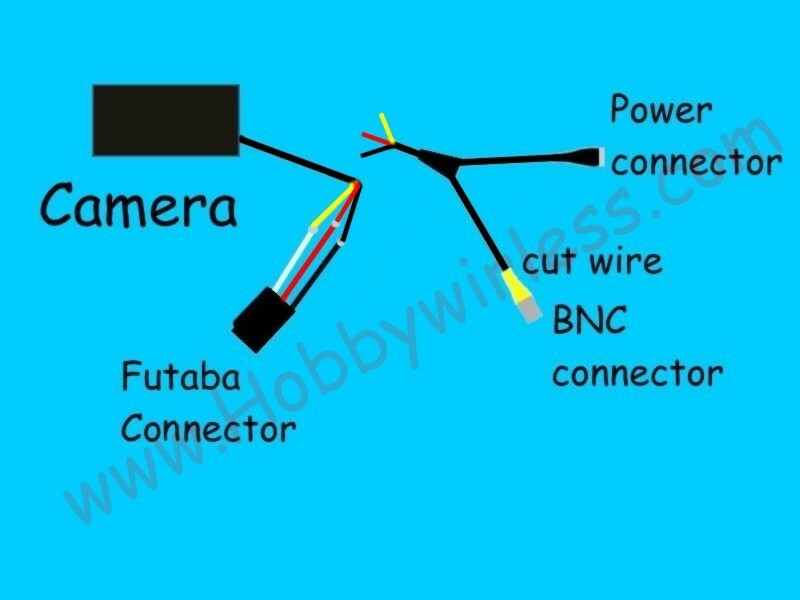 How to change your heavy camera stock connectors to servo type connector. This precedure is for cameras that don't have plug and play cable. 22. 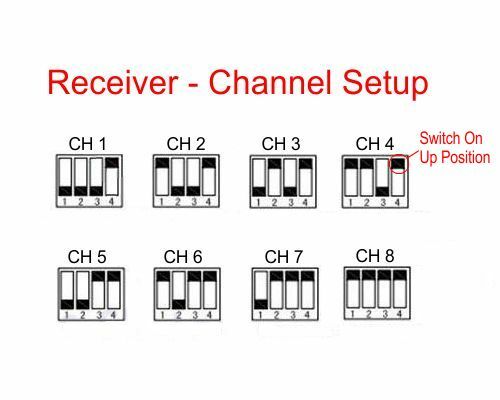 Make sure your transmitter is connected corrected making sure the polarity is not reversed. Also do not exceed the maximum voltage recommended by the manufaturer, otherwise it will cause permanent damage and void the warranty.? 24. 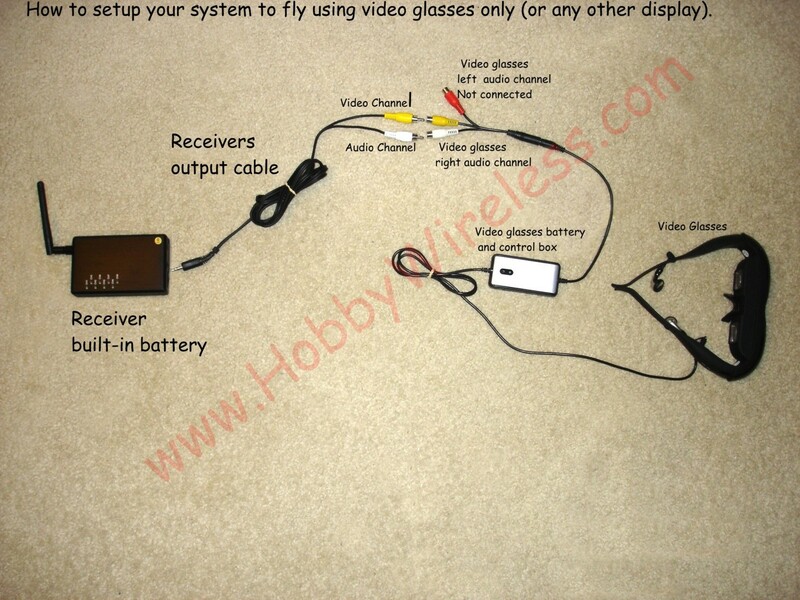 How to connect the video glasses to the receiver? 25. 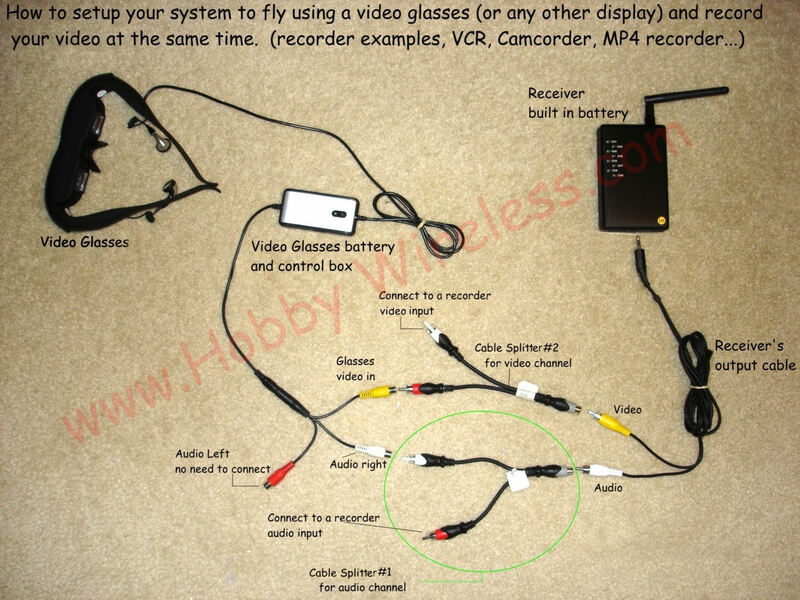 How to connect the video glasses and a recorder to the receiver using splitter cables? 26. 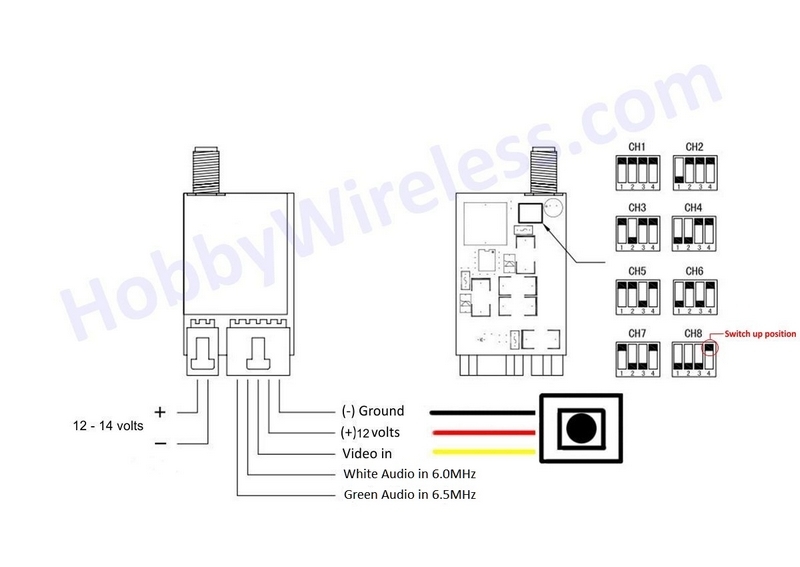 WIRING DIAGRAM FOR OSD PRO CAN BE FOUND INTO THE INSTRUCTIONS MANUAL OR ALL OVER THE INTERNET. Camera Lens F.O.V. (Field Of View) chart. Please take a look at our FAQ page for more information.